Cortex M4 + on-board audio and MIDI + midi host + lots of GPIO = iiinteresting low-cost audio/midi prototyping board. "What would be your dream setup? If Maple could include a chemistry software, it would be wonderful. But indeed, I am not sure that this would change a lot. What I need is intelligence, kindness and time." That. This worked for me, so I'm bookmarking it not to lose it! "A Thankful Village is a village where every soldier returned alive from World War 1. The term Thankful or Blessed Village was coined by Arthur Mee in his set of guidebooks, The King's England in the 1930s. Darren Hayman is visiting each of the 54 Thankful Villages and making a piece of music and a short film for every one focussing on village life. Some take the form of instrumentals inspired by location, some are interviews with village residents set to music, others are new songs with lyrics or found local traditional songs." Lovely project from Darren Hayman. "The Unfortunates" as a kind of promenade; marvellous. "The small institutions, public figures and spaces that I lament might all seem insignificant but, collectively, used to and still could make a difference, despite capital's determined attempts to neuter their efficacy via co-option and divide and rule. I've often felt elements of the atheist left wing ought to tone down their strident hectoring and remember that social justice is at the heart of many Christian movements, especially Methodism. Similarly, many Christians should consider that Jesus told them to care for the poor, not peer judgementally into people's bedrooms." Amongst other things in this thoughtful, cogent article – which made a nice alternative from the yelling on social media and the yelling on media platforms from, well, pretty much everyone. (Also: Ramsgate Music Hall looks great; I did not even know). I’m pleased to announce Richard Birkin and I have been selected as part of the mv.works 2015-2016 cohort. 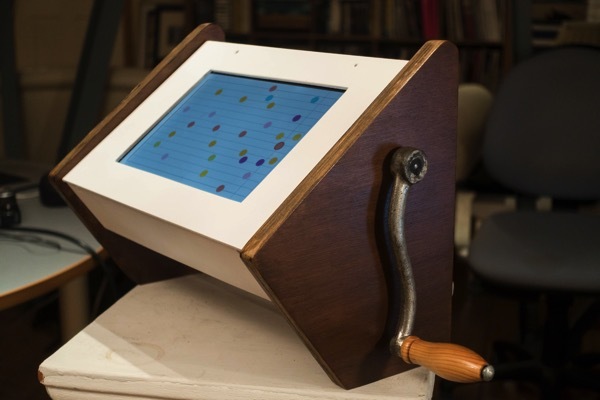 We’ve received funding to work until April 2016 on a new iteration of Twinklr – our physical/digital music box. More at my site. Suffice to say: this is tickling lots of my interests (which you might have seen hinted at in the past year of links) – hardware; building tools for creation, building instruments for performance, improvisation, and composition; the interface of technology, music and sound. Quite excited. Amongst many other things, bookmarked for "composing music means building an instrument"